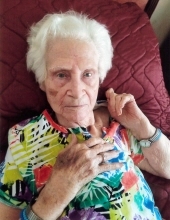 Eddie Fae Nesbit Lee, 104, of Stone Mountain, beloved wife, mother, grandmother, great grandmother and friend, passed away Monday, February 4, 2019. Born in Tucker, GA, September 17, 1914, she was the daughter of the late Fred, Sr. and Clara Golden Nesbit. Eddie enjoyed spending time with her family. Eddie is survived by her daughter, Marcia Toland and her husband, Danny; three granddaughters, Nancy Lane and her husband, Scott, Vickey Golden and her husband, Danion, and Celia Owen and her husband, Hays; grandson, Danny Toland, Jr. and his wife, Debbie; six great grandchildren; four great-great grandchildren; and many more loving family and friends. In addition to her parents, Eddie was preceded in death by her husband, Alfred Lee; son, Michael Lee; her twin sister and several siblings. The family will receive friends from 6:00 p.m. - 8:00 p.m. Tuesday, February 5, 2019, at A.S. Turner & Sons Funeral Home. A graveside service will be held at 2:00 p.m. Wednesday, February 6, with Pastor Phil Nall officiating at Decatur Cemetery, Decatur. To send flowers or a remembrance gift to the family of Eddie Fae Lee, please visit our Tribute Store. "Email Address" would like to share the life celebration of Eddie Fae Lee. Click on the "link" to go to share a favorite memory or leave a condolence message for the family.